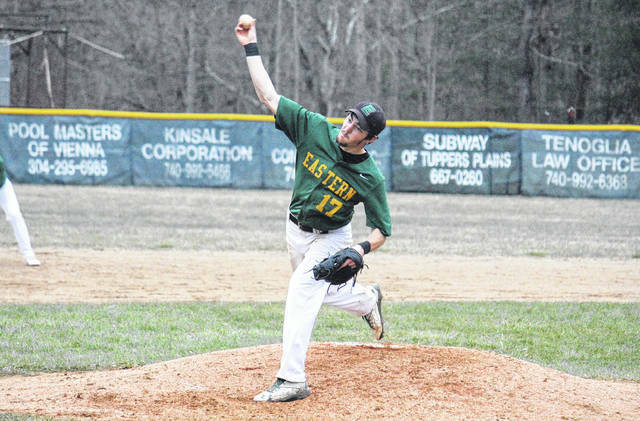 Eastern senior Ethen Richmond (17) delivers a pitch during the Eagles’ 11-0 victory over Miller on Tuesday in Tuppers Plains, Ohio. TUPPERS PLAINS, Ohio — You can’t lose if they don’t score. 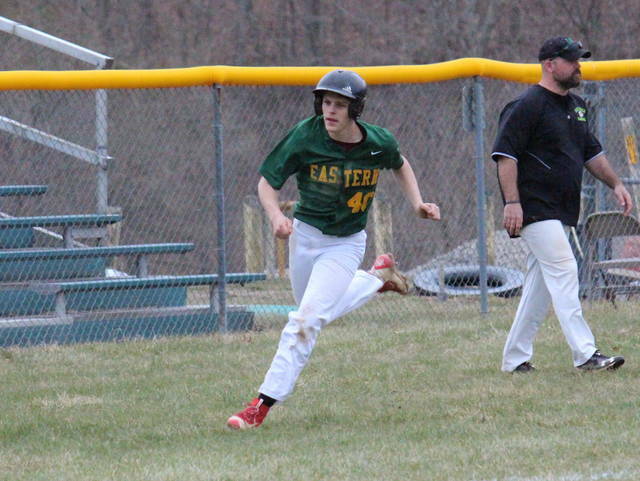 The Eastern baseball team picked up its second shut out of the season on Tuesday on its home field, defeating Tri-Valley Conference Hocking Division guest Miller by a 11-0 tally in five innings. Eastern (4-0, 2-0) held the Falcons off the bases entirely in the first two innings, in which time the Eagles opened an 8-0 lead. In the opening frame, the hosts struck for five runs, capped off by a two-run double by Ryan Harbour. A hit, an error, a walk and a sacrifice led to three runs in the second frame. Miller broke through in the hit column with back-to-back singles to start the top of the third, but the Eagles escaped unscathed. In the third home half of the inning, Matthew Blanchard singled home Colton Reynolds, and then Austin Coleman singled home Blanchard and Isaiah Fish to give EHS the 11-0 advantage. Eastern left a runner in scoring position in the bottom of the fourth, and Miller stranded runners on second and third in the top of the fifth, but neither team made it around to score and the Eagles took the 11-0 mercy rule win. Ethen Richmond was the winning pitcher for the Eagles striking out 10 batters in four innings, while surrendering two hits. Reynolds pitched the fifth, allowing one hit and one walk, while striking out three. Dishon suffered the loss in four innings on the mound for the Falcons, surrendering 11 runs, eight hits and three free passes, while striking out one. Blanchard led the Eagles at the plate with a 3-for-3 day, featuring three runs scored and one run batted in. 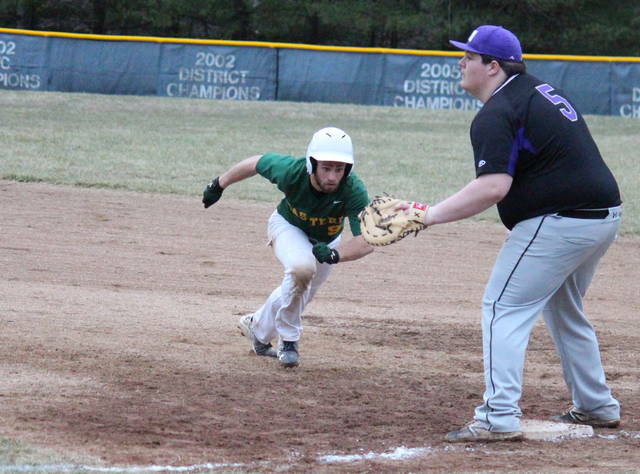 Josh Brewer was 2-for-3 with a run scored, while Harbour doubled once and drove in two runs. 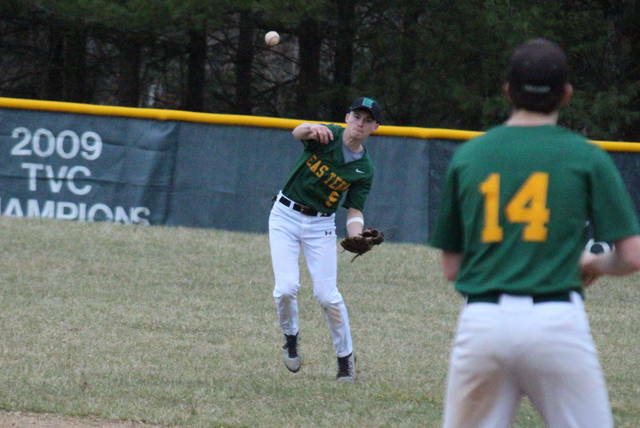 Coleman singled once, scored twice and drove in two runs, Reynolds singled once and scored once, while Richmond and Nate Durst added a single apiece. Fish scored three runs in the win, while Kaleb Hill scored once. Davis had a pair of singles for the guests, while Doughty had one hit. The Eagles committed played errorless baseball and left four runners on base, while Miller had three errors and left three runners on base. These teams are scheduled to meet again on April 16 in Perry County. Eastern will try to move to 5-0 on Thursday at Waterford.